(CNN) - New Jersey Democrat and gubernatorial hopeful Barbara Buono released a new web video Monday–but it's not the ad getting the most attention in the Garden State these days. Republican Gov. Chris Christie is taking heat for his role in a new tourism ad for his state following the devastating impact of Superstorm Sandy. The television commercial, released last week, is part of a $25 million tourism campaign using federal funds to promote the Jersey Shore this summer. Christie, who's running for re-election this year, makes a cameo in the 30-second spot, prompting some critics to say the potential 2016 presidential contender is using federal taxpayer dollars to boost his political image. After Congress delayed sending tens of billions in relief aid to Northeastern states at the beginning of this year, Christie went on a blistering critique of Washington lawmakers during a now-famous press conference. "We respond to innocent victims of natural disasters, not as Republicans or Democrats, but as Americans," he said, adding politics was trumping the needs of U.S. citizens. "For me, it was disappointing and disgusting to watch." The Star-Ledger in New Jersey noted in a biting editorial Sunday that it's not the people who are most bouncing back from the story who get to star in the tourism ad–it's the state's governor, who already gets plenty of air time and positive ratings as the public face of state recovery efforts. "(It's) not the small business owners working to get back on their feet. Not shore residents trying to rebuild, or their kids," the editorial stated. "Not even celebrities, as in the 'Fall in Love with Louisiana All Over Again ad campaign after Hurricane Katrina, which featured local stars who participated for free. Were Bruce Springsteen and Jon Bon Jovi simply unavailable?" Christie may face more questions Monday when he makes a media appearance on the Lavallette Boardwalk. The governor and his family appear in the ad for about five seconds at the end, as they sit on the shore and declare the state is "stronger than the storm." Christie has argued in defense that "there's nothing political about the ads" and his aides point out that the commercials won't even be running in New Jersey itself, according to the Star Ledger. But the editorial asked that "given Christie's presidential ambitions, is it any surprise that he'd use federal relief dollars to splash his face all over TV in New York, Pennsylvania, Maryland and Canada – in addition to ads in print, on the radio and Internet?" 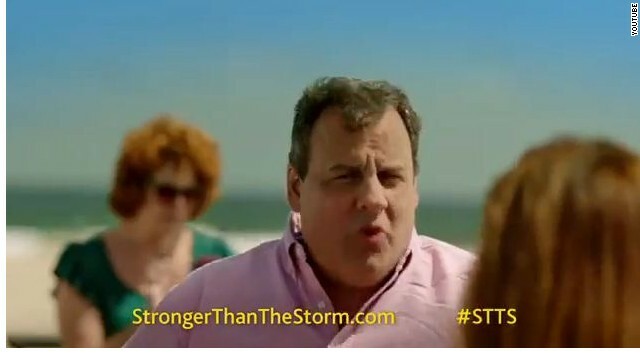 Colin Reed, a spokesman for the governor, told CNN the move was a creative decision by the Stronger Than The Storm campaign to include Christie and his wife in the ad. "They are in a uniquely qualified position to tell a very wide audience beyond New Jersey that our state and our Shore is open for business," he said. Christie saw a surge in his poll numbers during the aftermath of the storm, a popularity that he's maintained in the last six months. Recent surveys also indicate the governor has a strong advantage over his Democratic opponent in this year's gubernatorial race. In Buono's new web ad, the state senator takes a light-hearted approach in telling voters how to say her often-mispronounced name. She has been vastly outspent by Christie in ads. Good grief ppl, get over it. The man has shown, unlike nearly all other politicians, that he truly cares for the job that he is doing. The man is able to set aside politics and do what is in his state's best interest. Sadly, he is probably one of the last republicans to be in that party. The rest are neo-cons and tea*. Well who was it who stood up to critics to get his state the money when his own party in Washington was telling him NO? And now he can't take the credit for his excellent work? Why not? oh my god...enough...I am a liberal democrat and for people to take issue with the Governor of NJ being in an ad to promote his state need to stop and think before they speak. People need to grow up and stop making everything about politics. This country is about PEOPLE and Christie is the face of NJ. Some people just always have to complain (usually Teahadists trying to destroy our government). The more tourism he brings in for his state, the sooner the little business owners re-build and flourish and offer other jobs. Its a good idea, now matter what the politics. Get over the nonsense people. Im from NJ, and I consider myself a Dem.... but this is just an idiotic story. Im not mad at all, he tells it like it is.. A man of the people in my humble opinion. Ohhhh and if I remember, wonder if Arnold caught heat for his "come to California" tourist ad! .Total crock. I am in central NJ right now just cleaning up from dinner and the ad came on the NY ABC affiliate, most certainly the home market broadcasting to millions of NJ voters. It is an example of how lost the GOP is that would utter his name near the word president. My taxes have continued to rise under him, he's giving away patronage jobs left and right, his past as a lobbyist and mediocre at best track record at the US AG office after he fund raised for an appointment. Dead in the water before he starts. Before anyone cries about me being a liberal, I voted Gary Johnson in the last election, and have bounced back and fourth between parties from the local level up to the federal level, I am a proud independent. Lots of Governors appear in state tourism adds. This is a tempest in a teapot. This is totally ridiculous. Christie is a likeable guy that can clearly help the cause. Here is a guy whether he be Republican or Democrat is a decent and great governor. I agree with Scott about that if you think this is a problem you are the problem and need to get a life! He's the Governor of New Jersey for God;s sake. What;s wrong with promoting tourism? Get a life. This is a non-story. I'm a democrat from Connecticut and I see nothing wrong with Christie's participation in tourism ads. It seems as if everything is out of bounds for politicians nowadays. Some people seem to have an axe to grind for no reason and opponents should back off both Christie and Obama. Both these guys have better character than many of their predecessors and both are trying to do what's best for the people they represent. Not too long ago we had dishonest people in office and now, for once we have an honest governor and honest president and people want to knock them down. It's tragic that people are so blind to the truth yet are so ready to believe lies fed to them when they are wrapped up in a flag. I'm a Democrat. But what's the problem? The guy is the Governor of the state. Why shouldn't he be in the ad? Get over it! Governor Thomas Kean appeared in NJ tourism ads all the time. Don't we have more important issues to resolve?? Gov. Christie deserves credit for believing in and going to bat for NJ and working on behalf of the people of NJ and elsewhere.